Representatives from SAV Systems joined over 200,000 other visitors to this year’s ISH exhibition in Frankfurt, providing an ideal opportunity to meet with key suppliers, including Danfoss, EC Power, FAR, Cimberio and AirMaster. 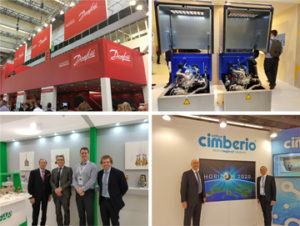 With nearly 2,500 exhibitors from 61 countries, ISH also provided the ideal venue to attend a range of presentations and catch up with the latest innovations. “It is always interesting to see what other companies are doing and to evaluate if any of their developments could be of value to our customers,” explained SAV Sales Director Jan Hansen. “There was also a considerable amount of technical information available, which often points to better ways of doing things,” he added.